Outfit your team in the latest and greatest gear from Under Armour! Learn more about Under Armour uniforms below. It’s our mission at Baseball Factory to prepare young athletes for the next level. Through detailed evaluations, player development and college recruiting guidance, we provide high-level experiences to help them achieve their goals. Sometimes, confidence on the fields starts with your uniform. If you LOOK GOOD, you FEEL GOOD, and if you FEEL GOOD, you’re more likely to PLAY GOOD! As an official partner with Under Armour, we can provide teams with up to 40% off Under Armour uniforms, cleats and apparel! Check out our current packages. Choose one or customize your order! We currently have three team packages: a practice pack, a stock game uniform pack, and a custom game uniform pack. All items can be decorated with your team’s logo, player name, and player number. The packages are not limited to these items only. 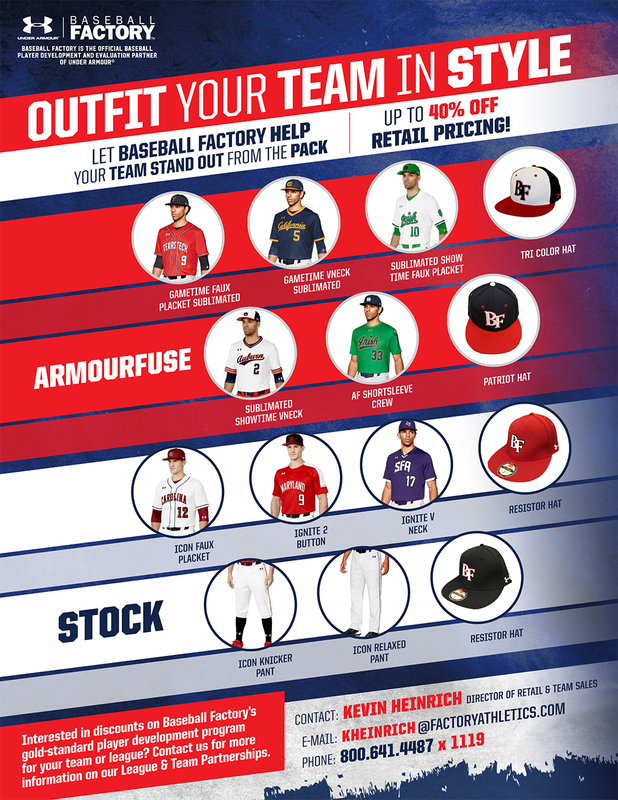 We can create custom packages for your team as well, whether it’s footwear, hats or bags; we can design something unique to your team’s needs. Check out additional gear here! Please contact Retail & Team Sales Director, Kevin Heinrich for more information.